A species that competes for most scented orchid with yeaterday’s Bifrenaria harrisoniae is todays Australian species. Dendrobium delicatum is a natural hybrid between two Australian species, that have already featured in 365 days, Dendrobium speciosum and Dendrobium kingianum . 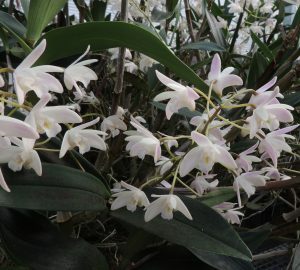 With the variable nature of the parent species it is not a surprise that Dendrobium delicatum is highly variable too. 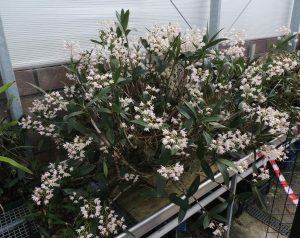 We have clones that are blush pink, white and cream but all are very fragrant. The plants are variable too but generally have long pseudobulbs (up to 40cm long) which are much thinner than those on Dendrobium speciosum. The plant makes a great specimen as it gets older and our biggest plant shown here is now more than 2m across and a wonderful thing.